Finding gifts for gun owners can be a bit challenging if the recipients already “have everything.” That’s why Gun Digest put together this list of gifts for gun owners. The staff believes in these products enough to sell them outright at GunDigestStore.com, so you can’t go wrong. The Snagmag concealed carry magazine holster makes pocketing spare ammunition a breeze. Watch a video demonstration. Gun Digest Tip: Make sure you know the model number of the pistol the recipient uses for concealed carry. Each Snagmag is model specific. These universal, easy-to-install Gun Digest gun safe lights turn on and off automatically with long-lasting LEDs. The lights solve one of the most common problems to storing a gun: dark gun safes. Pick up four lights (that’s two two-packs) for medium to large safes. Watch a video demonstration. Gun Digest Tip: Best gifted with a pack of AAA batteries. It’s still 2014 – they don’t have this yet! 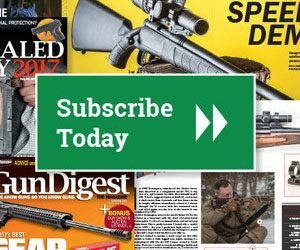 You can’t go wrong with this page-a-day calendar, which offers photos and information across the spectrum of firearms. Gun Digest Tip: Pair the calendar with the new Gun Digest 2015 book and save on your order. Gun Digest 2015 is the flagship book that Gun Digest publishes. Did we already say they’re cool? The most popular firearms of today started as sketches yesterday. Display a piece of gun history with these firearm patent print posters at GunDigestStore.com. Four models are available, and any one of them will look terrific on the wall. Gun Digest Tip: These posters don’t come with frames, so you may want to pick one up. The 2015 Standard Catalog of Firearms contains pricing and condition information for thousands and thousands of guns. If the pricing information isn’t enough, it contains tons of trivia. You can’t go wrong with this book. Gun Digest Tip: This book is similar but not quite the same as The Official Gun Digest Book of Guns & Prices and the Blue Book of Gun Values. Completing the trifecta will ensure your favorite gun owner is covered. This is one area where there’s no such thing as too much information.